These Easy Shrimp Tacos can be on the table in under 20 minutes! They are great for a healthy weeknight dinner that everyone loves! Well, the kids are back in school. Not mine. Those days are long over. However, I still need easy recipes. Some days I am content to spend a good hour or two in the kitchen and some days not so much. This easy shrimp taco recipes is for those days when I want an amazing dinner, and I want it quick and easy. You can have these tacos on the table in under 20 minutes! Seriously. Tacos are my go to easy food. With a good vegetable and/or fruit salsa, they are pretty much a complete meal. I don’t make the kind of tacos that are loaded with cheese and sour cream (though there is nothing wrong with those) I stick to tacos that are a little more on the healthy side. Some of my favorites are Chicken and Chorizo Tacos (go read about the chorizo trick!) Shredded Pork Tacos with Pepita Slaw and Spicy Fish Tacos with Fennel Slaw. I’ve mentioned before that I am trying to include more variety in my meals each week. Trying to make sure I include beans and legumes, fruits and as many colors as I can, and eating a couple of meatless meals a week. As alway, I used my Quick Pickled Red Onions (minus the cloves), that I always have in the fridge, instead of raw onions. You can also make a little extra of the salsa and spoon it over some brown rice for a quick lunch! I found these tacos in Woman’s Day Magazine. These tacos are so easy to make! Use your favorite chef knife to chop the salsa ingredients and combine in a medium bowl. Saute the shrimp over medium high heat in your favorite frying pan. Top tortillas with shrimp and salsa. Serve in cute taco holders. 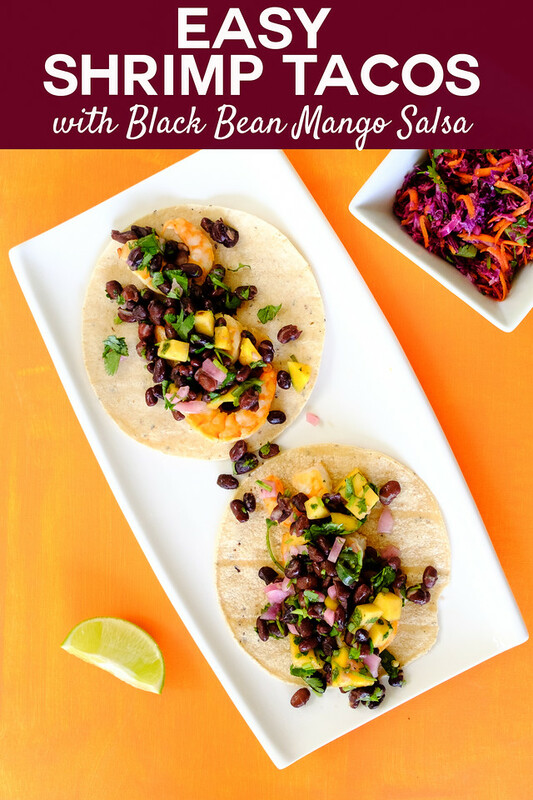 These Shrimp Tacos with Mango and Black Bean Salsa are easy and delicious! Season the shrimp with salt and pepper. Heat the oil in large frying pan over medium-high heat. Add the shrimp and cook for about 2 minutes per side. Place the shrimp on the tortillas and top with the salsa. Serve with lime wedges. It already feels like autumn here in the UK but these tacos look like a good way to feel a bit more summery! This is right up my alley, I could eat that salsa all by itself for dinner, just hand me a spoon! I could eat these every night! I totally relate to your comment. In my book Fall has started now that school has started, if only the hot weather would catch up! Yum! I love how easily these tacos come together. So full of color and flavor too! The combination of mango and black beans made me drool… Love tacos and they’re one of my favorite food. We will love your Shrimp Tacos, the mango and black beans are a great combo. Thanks so much for sharing your post with us at Full Plate Thursday and have a great weekend! Tasty! I just happen to have the shrimp and black beans. YUM!